NASA in Aberdeen “Inspiring the Next Generation” will return to Aberdeen for a third year and once again engage with primary schools, secondary schools and the general public with a series of events from Monday 11 March to Saturday 16 March. Each event is designed to inspire the next generation of energy industry professionals by providing a rare glimpse into the world of NASA Engineering, Space Exploration and its links to the Oil, Gas and Energy Sector. This year’s programme will feature NASA Engineer, Heather Paul, who is the Health and Medical Technical Authority for the Orion Crew and Service Module, and former NASA astronaut Carl Walz of global service company, Oceaneering, who flew four spaceflight missions on the Space Shuttle and Space Station, logging 231 total days in space! Primary school sessions will take place at Aberdeen Science Centre, secondary school pupils will enjoy presentations at Robert Gordons College and Meldrum Academy, and the general public are invited to a fun day at Aberdeen Science Centre on Saturday 16 March, as well as public talk on Friday 15 March. Delivered by Heather and Carl, the public talk on Friday 15th March will allow attendees to discover how technology and expertise developed for the oil and gas industry transforms human and robotic space exploration – past, present and future! Tickets are available here. 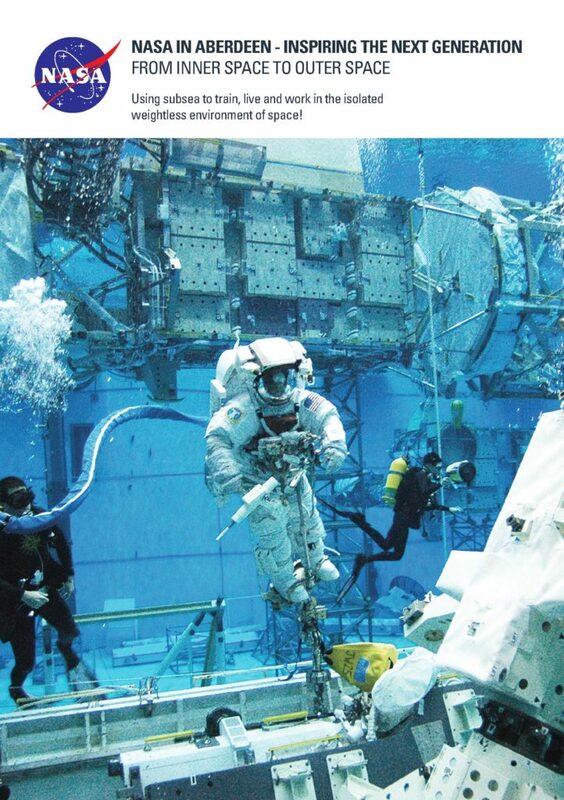 Colin Black, Chairman of NASA in Aberdeen commented “Hyang Lloyd (President Scottish Space School Foundation USA) and I met with astronauts Michael Bloomfield and Carl Walz at their Oceaneering facility in May 2018 and were inspired by their space missions, links with subsea and robotics. Heather Paul’s work on the NASA life support system fits well with our 2019 theme and Heather is an exceptionally inspiring speaker, as such we are very much looking forward to Carl, Heather and Hyang’s visit to the North East of Scotland in March. As well as the school presentations and public talk the NASA visitors will experience our version of an “Outlander Tour” which includes Castle Fraser, Aquhorthies stone circle and Glen Garioch Whisky. 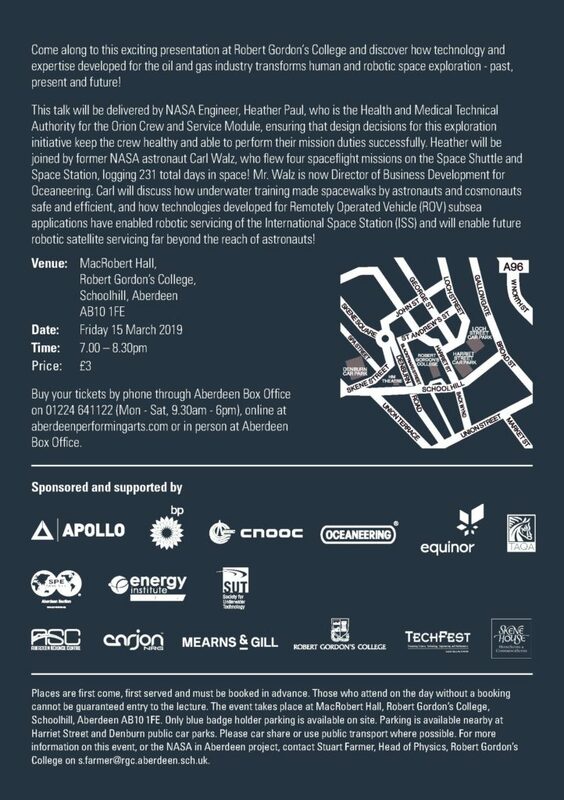 NASA in Aberdeen is a joint initiative organised by the Society of Petroleum Engineers Aberdeen Section, Energy Institute Aberdeen, Highlands and Islands Branch, the Society for Underwater Technology, TechFest and Aberdeen Science Centre. You can buy your tickets by phone or through Aberdeen Box Office on 01224 641122 (Mon – Sat, 9.30am – 6pm), online here at aberdeenperformingarts.com or in person at Aberdeen Box Office.